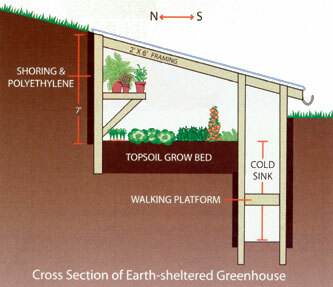 A greenhouse is built into a South-facing slope of a hill or man-made berm. Walls are constructed out of framed timber, concrete or cinder block to create a stable structure. Like a standard solar greenhouse, the roof and South facing side and is covered with a glazing material, like polycarbonate plastic. A cold sink – a small walk-way dug deeper on the South side — draws down colder air (as warmer air will rise). 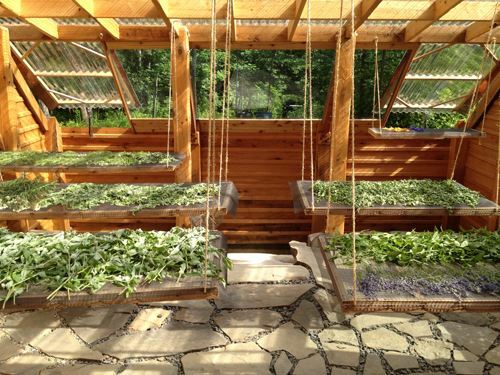 It also allows the roof of the greenhouse to have a higher pitch, which is important to maximize solar gain in the winter months at Northern latitudes. Stability and longevity: A framed greenhouse is going to withstand the pressure of the Earth pushing in on the structure over time. 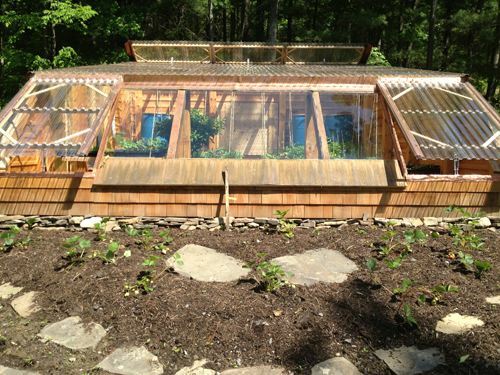 It’s built like a solar year-round greenhouse, only underground. Mike Oehler’s have been partially underground for over 30 years with little maintenance. In your book you describe building the frame the greenhouse out of wood (like a standard structure) and protecting the wood with a layer of polyethelene plastic. Why did you go this route? It’s the lowest cost if you have your own timber supply. You can use used lumber for the materials and walls. Even if using new lumber it’s cheaper than concrete and cinder block. Any other methods for building the walls underground? Concrete is absolutely an option and I would encourage it if you do not have timber on your land. How long have you had the greenhouse? Have you had to do any major renovations or maintenance? Lets put it is way: the first structure I built with the PSP method I built in 1971 and it’s still in use. I did re-do the frame because the posts in the ground were not treated. I built that house to last 7 years. It still went about 12 years and then we had to replace those posts. The greenhouse I used for 20 years and it was a great little greenhouse. The only thing I replaced was the glazing once. There’s air leaks; there’s an entire wall that’s exposed that doesn’t have insulation. It’s not a great greenhouse but it’s better than any in this area. I don’t know of any that don’t any that don’t take some source of heat in this area. Mine is just heated by the sun and the soil. What do you typically grow in the winter or other seasons? We grew tomatoes until the 2nd week in December and greens through the winter. 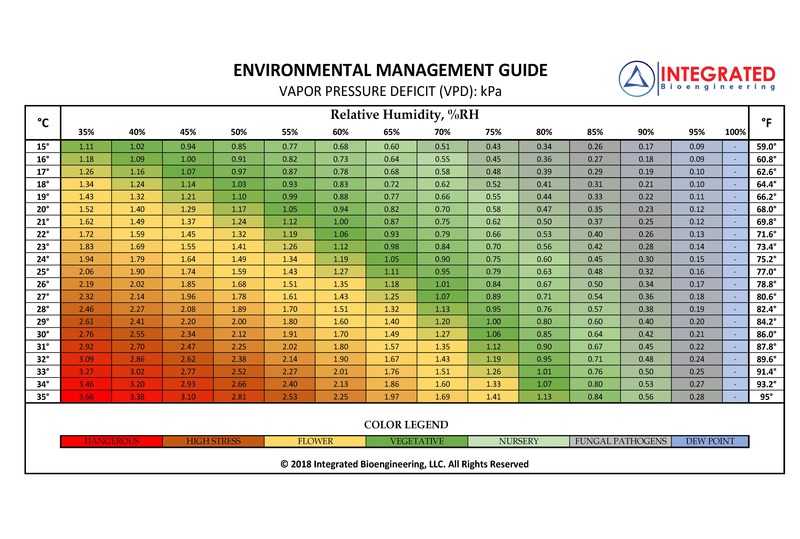 Can you estimate indoor temperatures in your earth sheltered solar greenhouse? No, but a guy in Canada did. It’s at least 10 higher than outside air. At least. What’s the temperature in the cold sink? When I first built the greenhouse, I discovered I could put my beer down and it would be nice and cold. The cold sink was probably 60-65 degrees. That showed me the difference.